I am an independent kitchen installer & supplier with over 10 years experience in the kitchen industry. If you choose to supply your own kitchen or one from the 3 kitchen supply companies I use the kitchen will always be installed to the highest standard. I install laminate or solid wood work tops and if you choose granite or another solid surface work top I am happy to work with which ever company you choose to make sure the kitchen installation goes smoothly from start to finish. All 3 kitchen supply companies I use (Howden’s, Magnet & Benchmark) offer a free planning and design service which involves you the customer at every stage. 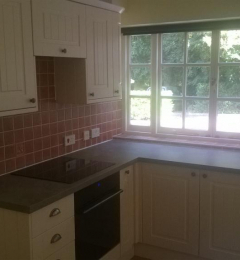 I have a great team of tradesman around me so can offer full kitchen installations. Brian and Liam were professional and courteous throughout. Everything was tidied at the end of the day. They worked tirelessly until the job was done. Very pleased with the end product. Everything was explained and Brian was accomplished at overcoming any problems which arose. Brian and his team did an excellent job replacing my kitchen. Excellent communication in setting up the work and throughout the project. I am so pleased with my new kitchen and the standard of work. Thank you. Highly recommended. Brian and his team worked to the highest standards. Brian managed the whole project from start to finish making the process very easy for us. He and his team are consummate professionals working to the highest standards. This was a hassle free, friendly and very efficient service. I would happily recommend Brian for any job you may need doing. As a property company we demand consistency and excellent communication from the contractors we work with - Brian is the very epitome of those qualities and we will certainly be continuing to use him and his team on future projects! Fantastic! The one outstanding factor here was the communication, which was brilliant. It meant that when I walked into the finished kitchen there were no surprises. The work was completed on time and to a high standard. I was always consulted over details, such as the positioning of handles. Brian and his son were unfailingly polite and a pleasure to deal with. I am very happy with the new kitchen. This was a very well planned and well executed job, completed on time and with no fuss. Very minor snagging item attended to immediately. Brian's work was excellent and the contractors he used for specialist work were all very professional and skilful. We are delighted with the job and would highly recommend this firm to friends and family, and indeed have already done so. Brian fitted our new worktops, tiles and appliances. He dealt with all the ordering and delivery of the materials needed and has installed them to a very high standard. The workman ship is excellent and the finished product is wonderful. Him and his team did an excellent job and would recommend to anyone needing a new kitchen installed. Excellent workmanship, and conversations with us to ensure the work was done as we wanted. Our kitchen is a difficult shape and was a challenge for Brian, with many corners to cut ,which he did with great skill It was a pleasure to have him work in our kitchen. Brian did a brilliant job of fitting a new Howdens kitchen and came back to install some additional storage for us too. We are delighted with the result - it’s transformed our house. Would highly recommend. Our kitchen looks amazing because of Brian and his team. Everything was handled through Brian, he organised all the contractors making it a stress free experience and a pleasure to work with. Our kitchen supplier (Homebase) caused the problems, but Brian took care of these problems brilliantly and had already made a Plan B and Plan C in order to bring things in on time. Can't thank him and his team enough. First class! Brian arranged for Howdens to do a design plan and quotation for cost of the units and appliances. He recommended a tiler, electrician, plumber and plasterer. All the trades did a very good job and they were not the cheapest you could probably get but good value as I was impressed with all their work. Brian booked them all in at the appropriate time to fit around his install, and he also took delivery of the kitchen as I was away. His install was to a good standard and I was very pleased with the finish. Price was as quoted. This was the second time I had used The Kitchen Fitter and although this was a relatively small job it was completed with expertise and attention to detail. Brilliant !! Mr Kelly and his son worked extremely hard, without breaks, and to a very high standard indeed. They worked efficiently and with minimal disruption, clearing up thoroughly after each day and at the end of the work. We were surprised and pleased that the work could be started without much delay, and Mr Kelly came to see us the same day we contacted him to give us a quotation. We are delighted with our new kitchen and wouldn't hesitate to contact, or recommend, Mr Kelly again in the future. Very pleased with the workmanship and the finished result. Would use Brian again. Brian was a professional from measuring up my kitchen right up until the job was finished. Trustworthy and an excellent tradesman. Extremely pleased with Brians work. The whole project went without a hitch even though the suppliers sent damaged goods, Brian sorted out changing everything without even bothering me which was fabulous, he recommended all the other trades who were all equally efficient. I did think the whole process of putting a kitchen in would be very stressful with endless problems but Brian carried the whole project out very nicely indeed. Very very pleased with every aspect of the job and would definitely use him again or recommend him, my kitchen looks fabulous Brian.....Thank you so much! Due to source delivery problems with the supplier of the ovens I had to schedule the work over two visits. One for the main oven and the other for the smaller oven/microwave. Brian was most accommodating in this requirement and the work has been executed to my complete satisfaction. I need to add that Brian was very helpful in assisting me in my need to confirm if the existing electrical power available to the original ovens was suitable to the new oven installation. Thankfully, this matter was resolved by email with him and thus we avoided the additional cost of an electrical engineer's. From my first contact with Brian he was friendly, courteous, professional and extremely reliable, with great communication and all with a smile! He was able to quickly understand what I wanted to achieve in terms of look and function and the end result was exactly as I had hoped - this was especially difficult as the kitchen manufacturer was no longer in business so he had to use and modify some of the old kitchen units and combine them with new cupboard and drawers. The result was brilliant - you would never have known it wasn't the original kitchen. Look no further for any kitchen related! Brian and his team are very well organised and professional. The kitchen has been finished to an excellent standard and I am very pleased with the results. I would not hesitate to recommend Brian and his team. Exceptionally well organised with a programme of work provided as soon as you accept his quotation. All trades that he recommends, and whom you employ separately, [plasterer, plumber/gas safe fitter, and electrician] are those whom he uses regularly and all provide an exceptionally high standard of work. Our top of the range, handle less, Howdens kitchen is very unforgiving if fitted badly as the flush contours and rounded corners require meticulous attention to detail. Brian just excelled and the finished kitchen looks stunning. Brian was efficient, organised, professional and personable throughout the fitting of our new kitchen. He helped to organise the other trades and ensure that they slotted into the progress of the kitchen fit. Nothing was too much trouble for Brian and he overcame difficulties due to the age of our property very smoothly. He also went the extra mile by helping us with additional work and came up with good ideas to improve the overall success of the project. We would have no hesitation in recommending Brian to anyone wanting a new kitchen fitted. Thank you, Brian, we are delighted! Very satisfied with the work done. Mr. Kelly was prompt , on time and did the installation efficiently and neat. We have used Brian before for a full kitchen install. This time we needed a dishwasher replacing and a leak repairing. As always Brian makes an enormous effort to truly help and provide great service - he is courteous, honest and very straightforward to deal with. Luckily for us he was able to fit us in quickly and got everything sorted with a minimum delay. Unfortunately the job turned out to be difficult but Brian resolved the problem professionally and without any fuss. Highly recommended as ever. We found Brian on Checkatrade as looking for a new kitchen after recently moving. He was open and fair with the whole process and project managed the other services so the whole rebuild ran smoothly, he even dealt directly with the kitchen unit supplier when there was some errors, without intervention from us. I would fully recommend Brian and his services. Good workmanship, friendly, made good effort to tidy up inside and out. Would recommend. We are happy to recommend Brian and his team, who fitted a new kitchen and utility room for us. From initial consultation, Brian's experience was evident. He was able to identify potential issues before they arose and guide us with sound advice. I am very pleased with the kitchen which is finished to an excellent standard. Brian is well organised, efficient and highly skilled. I was kept informed at all stages which was most helpful. I would not hesitate to recommend Brian and his team. Very responsive to initial call, quote provided quickly, work carried out quickly and as agreed. Excellent service. Brian 's work and advice were first class - efficient and prompt. We felt confidence in his ability to solve our problem immediately we met him. If ever we need similar work again we will certainly go to him first and we have no hesitation in recommending him to anybody. No need to look anywhere else you have found the 'top' man. Supplied and fitted wire baskets and spice racks which supplier of kitchen in new-build could not do! Efficient, knowledgeable and very helpful, would recommend highly. Excellent work done; All the workmen were polite and knew exactly what they were doing, keeping me informed at every step. When I requested extra work which was not originally quoted for, they did everything to get that done in time with the original plan with no problems. Would recommend. Brian helped with the design, fitted it exactly as and when he said, other trades managed well by him, and overall it was very nice dealing with him. Really, a very easy process and great finished product. Brian installed a new kitchen and utility for us. He removed the old kitchen, organised the electrician, plumber, tiler and delivery from Howdens for us. His communication was excellent and kept us informed throughout the whole process. There were problems with the tiles and microwave we bought. Brian re-organised the trades and installation around the problem for us. We are very pleased with the job he's done for our kitchen and utility. Excellent survey, project management and completion. Highly recommended. Entirely satisfactory, on time, clean and tidy. Brian and Liam did a fantastic job for us. We hadn't prepared properly with getting appliances on site in time but Brian accommodated us with no delays, he just worked around any situation. He is obviously very experienced, does work to the highest standards and is a very pleasant gentleman to work with. He also works at a very good pace. We will be using again next year on another project. Price exactly as quoted. Perfect. The work was very professional. Brian and his apprentice were very courteous and efficient in their work . I would gladly use his services again. Brian was amazing. Really helpful guiding me through all the possibilities for my kitchen doors. Very easy to deal with and communicative at all times. I do not hesitate in recommending him. Brian was very communicative, and delivered a good level of service and quality of work. I'd be very happy to recommend. Brian is a reliable and flexible tradesman and a pleasure to have around. He wasn't able to complete the work initially due to the need for us to move a gas pipe, but he returned the following day and finished the job within an hour. Work completed on time although stared one day late due to a problem with the flooring being delayed. Brian is really excellent. I just wanted my existing kitchen smartened up with a new top and brand new fronts to doors and drawers. He came very promptly to do the work and was so clean and tidy too. The quality of the work done was excellent and very professional. I have absolutely no hesitation in recommending him. It was a difficult task. We had been trying for months to find someone to replace our fitted/integrated fridge. The Kitchen Fitter was outstanding in sourcing a fridge of the right dimensions and fitting it. I am very pleased, excellent job. We found Brian through Checkatrade. We live abroad and wanted a new kitchen fitted in a property that we rent off. Brian organized the purchasing of all kitchen units etc and provided all the other trades . There was one unit that was not required which he deducted from his estimate. He kept us informed throughout the process. We would not hesitate to use him again. Brian did a great job in removing our old kitchen and fitting a new one. It was tricky co-ordinating all the trades, but Brian managed all of that for us. Brian was efficient and timely in communicating with me, and carried out the work very professionally. I would have no hesitation in recommending Brian. Brian was a very courteous and reliable fitter who did exactly what he said he was going to do, and when. Also, when a problem developed with work not completed by him, he came out nevertheless (and on a Sunday) to ensure the problem was dealt with. I was impressed by that, in particular. Having been let down by builders we were extremely fortunate to find that Brian had a rare gap in his diary and was able to take on our new kitchen fitting. He responded quickly to our enquiry and attended the following day to price the job. The price was good and he was able to start within a few days. He arrives promptly for work and does not hang around gossiping about football like our builders. His power screwdriver was going within 3 minutes one morning! His work was excellent and he immediately returned on two occasions where slight 'tweaks' were needed. We can recommend Brian. Immaculate work and service. Couldn't have been better. I would thoroughly recommend the Kitchen Fitter at any time. Due to the job the worktops and the atrocious weather meant that they had to be cut inside the kitchen. The kitchen was left clean and tidy, had been cleaned really well. Brian and his team were very polite and courteous at all times. Excellent job done and really has made the kitchen look a lot more modern without having to change the cupboards. Very efficient service. Work completed to a high standard. Quick and good quality work. Courteous throughout and cleaned up after the work completed. A small job very well done. The best kitchen fitter in Winchester. Excellent service from start to end. Very happy. Well done team. Really helpful flexible worker. Honest and trustworthy with keys. Amenable to changes and worked around granite fitters. Highly recommend. Reasonable price compared to other quotes. Brian fitted additional floor units, worktop and tilling to my kitchen. The work was done very professional and to a high standard Brian is polite, very tidy and trustworthy. Highly recommended. All round, excellent though some dust and rubble left under units. Very punctual, communicated very well, performed work to a high standard. First class service and finished to a high standard. He was extremely obliging and helpful. Brilliant - friendly, very pleased. Excellent. Very fairly priced. Brian arranged the kitchen planner, delivery and installation and coordinated the schedule of work around all the other trades. This was quite a large project at a different location from my home address so Brian' s handling of the project made this a stress-free experience. Everything was completed to time and within budget. Excellent advice given throughout. Delighted with the outcome. A courteous, careful workman. Replaced existing kitchen. The job was thoroughly well completed. Highly recommend. Happy to recommend. Good work and very friendly and trustworthy. Only comment would be that could have tidied or cleaned up a little more, but overall very pleased and would use again. All work carried out thoroughly and efficiently. Very courteous and did the work at short notice. Kept us informed about his arrival time. Hard working, competent and pleasant. A reliable and courteous worker. Kept me fully informed of all partialities. Very pleased with finished fitting. Brian and colleagues were punctual, polite and efficient. Pleased with the thorough work. From the outset Brian was a pleasure to deal with. Speedy, efficient - his work was outstanding. Would definitely recommend him. Brian was very friendly, courteous, punctual with his work carried out professionally on time and on budget. Very pleased with my new kitchen. Excellent workmanship delivered in a positive cheerful manner. Brian did an excellent job with our kitchen. He was very approachable and friendly and took great care with fitting our solid wood worktop. He was reliable, tidy and finished in good time. I would have no hesitation in recommending him. Excellent service, could not be better. Great service, kept me informed on schedule of work, and did an excellent job. Would strongly recommend. All round great service from Brian. He gave us a competitive quote and a clear outline of the work involved and the timetable. It all happened as planned and the new kitchen looks stunning and most importantly is very well fitted. Brian is very professional, efficient and reliable. Brian was left with our key whilst on holiday so very trustworthy and polite. He has great communication before job started making sure everything is in place for the fitting of the kitchen. Everything is doubled checked His work is finished to a high standard. He is very tidy and makes sure everything is cleaned up after he completed job His rate is very good for fitting kitchens compared to other companies. Would definitely recommend him . Polite, friendly manner. Clean and tidy. All round a very good tradesman. Everything went well and we are very pleased with our new kitchen. Brian was very flexible about coming in as required to get the job done at times that were convenient to us, work was done to a high standard and useful advice was given on fitting the remainder of the kitchen (which we have done ourselves). One small snag with the sink fitting was resolved with a visit the very next day. Overall very happy with the outcome as well as the communication process throughout. Excellent , so tidy in his work could not be more helpful. Excellent job. Very good communication and time keeping. Work was to a high standard and would definitely use Brian again in future. Very pleased with the removal of the old kitchen and installation of a new kitchen. Brian was helpful, polite, reliable and trustworthy. All very much appreciated as we were away for much of the time the work was taking place. A while ago Brian fitted a new kitchen for us and this year he installed a new bathroom. We are really pleased with his workmanship on both jobs. He pays attention to detail, ensuring he knows exactly what the customer requires. He is reliable, punctual and tidy and we would have no hesitation in recommending him. Very professional and flexible. Would use again. Very professional, job completed as requested. Excellent workmanship and fastidious attention to detail. Brian (and Michael) were always friendly, helpful and polite. Working to a very tight deadline in time for Christmas, Brian ensured that I was kept fully informed throughout the process and delivered a top quality job. I am delighted with the result and have no hesitation in recommending him. The plan was created by Howdens and fitted by Brian who arranged for an electrician, plasterer and plumber as required. Brian showed considerable attention to detail but was sometimes hampered by mistakes on the Howdens' plan. He was flexible in making sensible modifications during the installation and attending to minor faults. Overall, we are very happy with the management, installation and execution of the job. Fantastic job. The kitchen was fitted very quickly to a very good standard. I found Brian reliable, very helpful and would not hesitate in recommending him. Nothing was too much trouble for Brian. I found Brian to be polite, efficient and would definately recommend him. Very good work, very flexible and polite. The Kitchen Fitter was very helpful, before, during and after the fitting process. There was good attention to detail and minor problems were rectified. He made the job look easy - everything fitted perfectly. Polite, clean and efficient, delighted with the result. I was really pleased with the finished result. Brian was reliable and his time keeping was excellent. His standard of work was very high. I recommend him without reservation. A relatively small job done quickly and well. Very helpful on the re-design and a nice quality of finish. Work carried out quickly and efficiently. Brian is reliable, professional and courteous. Reassuringly professional at all times. Absolutely brilliant. On time, clean and tidy and the fitting is fantastic. I would not hesitate to recommend him to anybody. I had a kitchen installed by Brian in Badger Farm in 2012. He delivered, on time, on budget, with quality and flexibility. I can't think of more to say, other than: next time I need a kitchen. I will definitely call Brian. I have no hesitation in recommending Brian. He is a good man, honest and very focused on doing his very best for you. He is good to work with and will listen and take care to provide good customer service. He works to time and to cost and we have been very satisfied with quality.